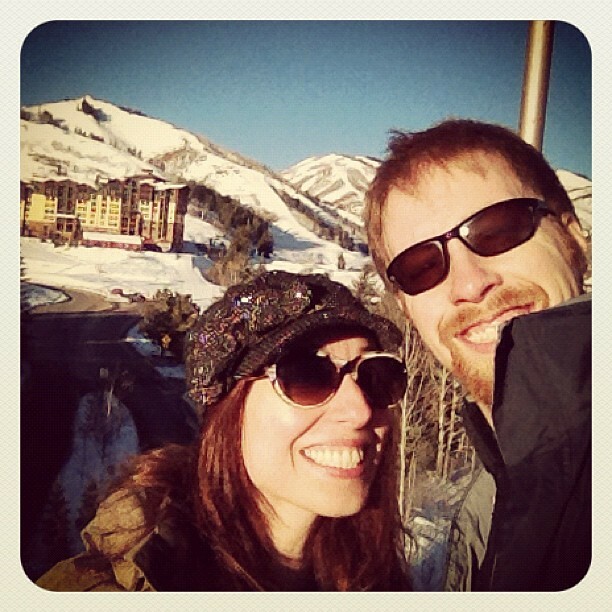 How does a New York native keep up with her Utah-bred, double-diamond loving husband on a ski vacation? It’s simple… take up snowboarding! When we ventured to Park City this month for Sundance we made sure to hit the trails at Canyons Resort. But since Jake and I have very different skill levels in skiing, I wasn’t looking forward to struggling down easy slopes while he conquered diamond trails. 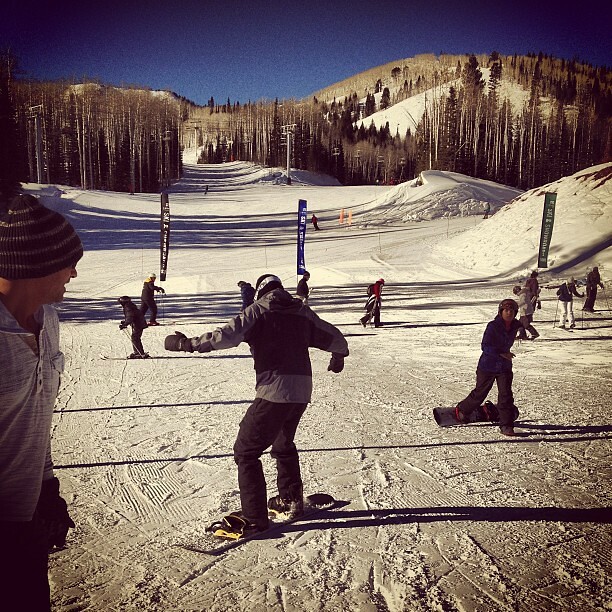 After checking out the Canyons website, the solution hit me: sign up for Snowboard School! We contacted the resort and they graciously gave us two passes to their beginner snowboarding class, which is held in a special beginner area. Jake and I spent a full day practicing our toe and heel turns in a small class led by master instructor Brooks. We capped off the day with a run down a real (albeit green-level) trail. Read on for the highlights of our snowboarding lesson– and if you have experience snowboarding, please share your tips by leaving a comment below! Besides the high elevation and world-class trails, we enjoy skiing in Park City because we have access to 30 years worth of vintage ski fashion in Jake’s mother’s house. 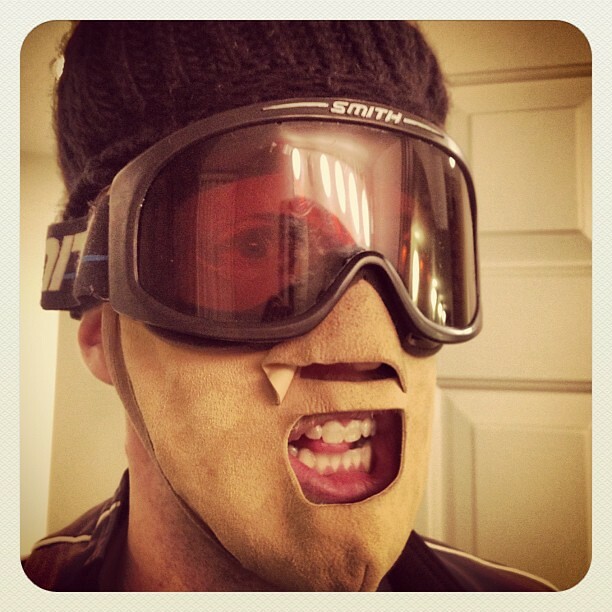 We spent the night before our snowboarding lesson sorting through her boxes of goodies, which include a leather ski mask (clearly a favorite of Hannibal Lector), orange-tinted goggles and neon neck warmers. While we ended up going with our more recent skiing gear, we did see a number of vintage styles on guests at Canyons Resort. 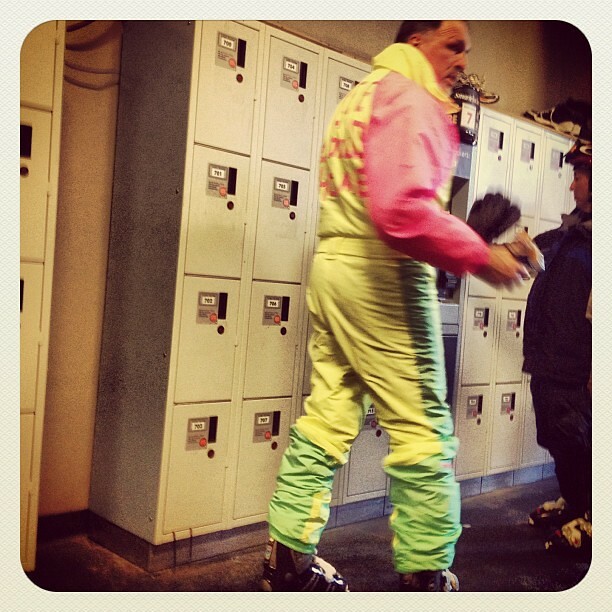 One older gentleman sported a full neon snowsuit from the 1980s. 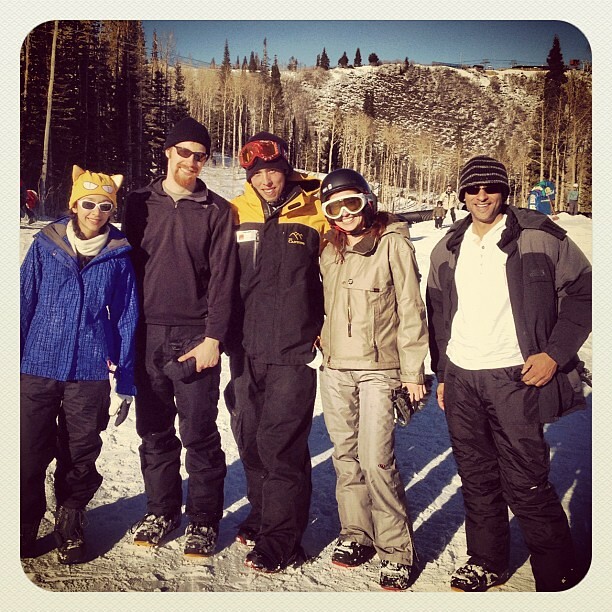 We love that skiing and snowboarding in Utah is about the experience, not the style! We arrived at Canyons Resort Welcome Center at 8:30 AM for our lesson. We were shivering on the open-air tram from the parking lot and were bracing for frigid conditions on the slopes. Fortunately the temperature climbed to the low 40s and we ended up shedding several layers of clothing on the mountain! The fence near the bunny slope was covered with fleeces and hats. When we signed up for the beginner lesson I was worried that our group would be filled with kids. However, there’s an age minimum of 13 for adult snowboard lessons at Canyons Resort; in our small group of five most people were professionals in their 20s and 30s. We met our instructor, Brooks, outside of the rental center and boarded the Red Pine Gondola together. Counter to my expectations, the beginner area was not at the base of the resort but was half way up the mountain. Park City is a favorite training ground for pro skiers and snowboarders and the Canyons does not have many green (easy) trails; most trails are blue (intermediate) or black diamond (difficult). The last time we skied at Canyons Resort, I comfortably navigated several blue trails before getting stuck on a steep stretch of the intermediate Upper Apex Ridge. Jake had to coax me along as I snowplowed my way back to the lodge. I was relieved to learn that the Ski and Snowboard School held lessons in a separate area designated for beginners only. It was a comfortable place for us to hone our skills since other snowboarders weren’t whizzing past and there were no obstacles like trees to crash into. Snowboarding and skiing are different art forms, as Jake soon found out. 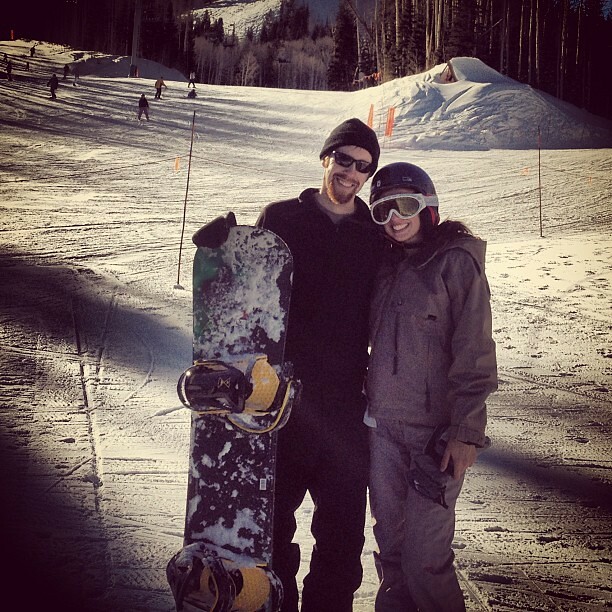 While he’s an excellent skier, we were both starting at the same ground level when it came to snowboarding. Brooks, our trusty guide, started us on the reverse side of the bunny slope so we were able to practice gliding on the board without falling flat on our faces. One at a time, each member of our group practiced gliding and heel turns while Brooks offered helpful corrections. Even though he was in his early 20s, Brooks had the patience of a Zen master and made sure we were comfortable with basic techniques before bringing us down the bunny slope. The beginner area at Canyons has an automated walkway that makes it easy to get back to the top of the slope after a run. After falling on my behind a few times during each run, I appreciated the assist! Jake and I had only snowboarded once before, over five years ago at Hunter Mountain in New York. Even though Hunter’s peak is much lower than the elevation at Canyons Resort (4,000 feet vs 9,900 feet), we felt much safer snowboarding here in Utah. Brooks made sure we could confidently ride forward and backward, with both left and right foot forward, before guiding us down a major trail. We worked up an appetite after our morning lesson and took the gondola back down the mountain for a lunch break (we weren’t quite ready to take the intermediate trail that led to the base). 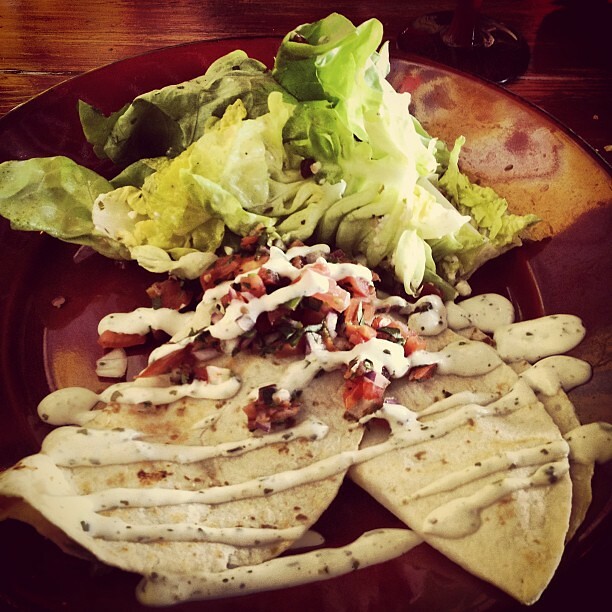 We enjoyed a delicious meal at the Red Tail Grill, where I ordered vegetarian pumpkin flower quesadillas and Jake savored a steak burrito. 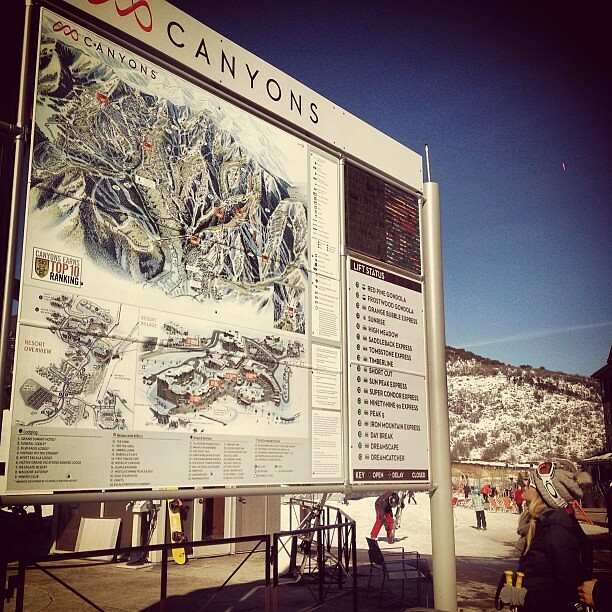 The dining options are one of the reasons we love Canyons Resort. The resort has several restaurants serving creative fare (including a locally-sourced bistro called “The Farm” that was named the best new restaurant in Utah by Salt Lake City magazine). Restaurants as well as huts serving hot cocoa and waffles are located at the base and on the slopes. The Red Tail Grill is located near a series of lounge chairs known as The Beach. Quite a few skiers were sunning themselves when we visited. After a lengthy lunch we met back up with our group in the beginner area. We’d missed out on a few turning skills but Brooks quickly got us up to speed. (Our group mates had grabbed lunch at the nearby Red Pine Lodge, which is a short walk from the training slopes). Our final assignment was to go down the green-level Meadow Way trail, which is used by the general skiing population. 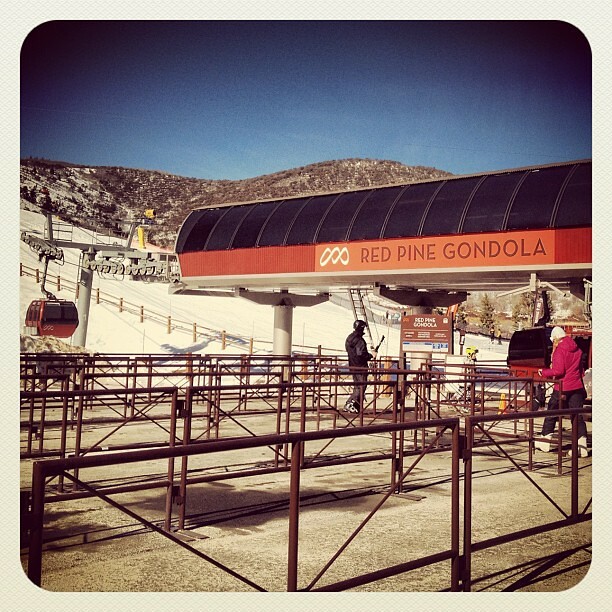 We hopped on another gondola and gathered at the trail head to go down together. Having Brooks at our side made me feel more confident and I made it down with only a few falls. (Jake fell into a gravity-defying forward somersault but managed to survive unscathed). After our run, every member of our group felt a sense of accomplishment. We posed for a group photo (that’s Brooks at center, above) and shared contact information. Now that I’ve graduated from beginner snowboarding at Canyons Resort, I feel ready to conquer those intermediate trails! 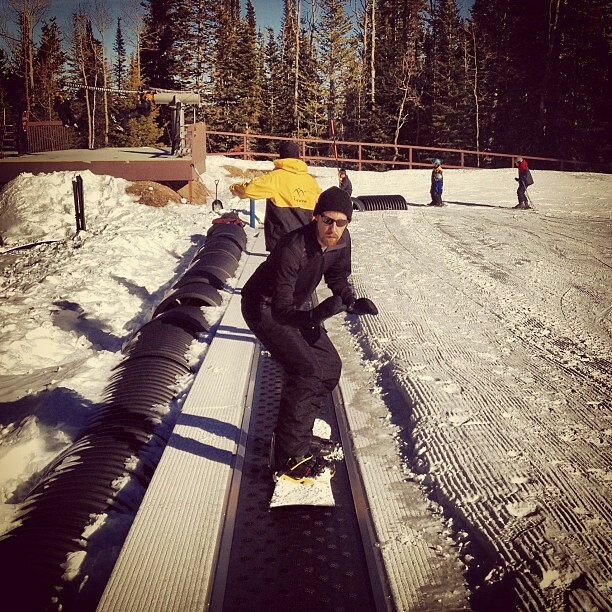 Whether you are in Park City for Sundance or vacation, I’d recommend taking a snowboarding lesson at Canyons Resort. The instructors focus on teaching the basics in a comfortable and safe environment and you’ll appreciate that beginners get their own separate training area. 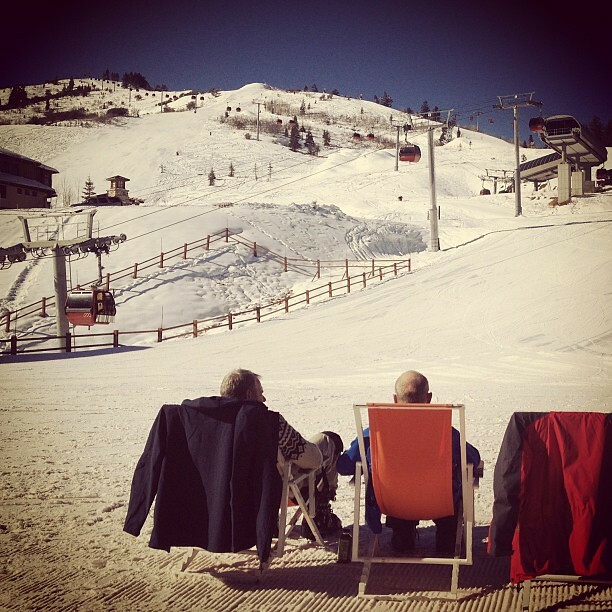 With plenty of dining options right on the slopes, you can comfortably spend a full day at the resort. Cost: Beginner snowboarding lessons cost $99.90 including equipment rental and 4 1/2 hours of instruction (broken into morning and afternoon sessions). We received two snowboarding lessons and lunch in order to write this review. As always, all opinions are our own. Love these pics! I’ve never been snowboarding or skiing before. I don’t really like the cold haha. So fun! I tried it once without lessons and boy was it a lot harder than it looked. Love your pictures! Very cool! I do prefer snowboarding to any other forms of outdoor winter sports, although Snow Shoeing was amazing too. you look like a snow angel! Nice photos! It’s awesome that you had a great time learning to board and left feeling confident (I know my first time left me a bit less confident haha). What do you think of this beginner snowboard? I rode it and it felt much easier than a traditional board. Would love to hear your thoughts!